Vitamin D is a fat-soluble vitamin that is naturally present in very few foods, added to others, and available as a dietary supplement. It is also produced inside our bodies when ultraviolet rays from sunlight strike the skin and trigger vitamin D synthesis. Vitamin D obtained from sun exposure, food, and supplements is biologically inert and must be converted by the body before it becomes active. The first reaction occurs in the liver and converts vitamin D to a substance called 25-hydroxyvitamin D, also known as calcidiol. The second reaction occurs primarily in the kidney and forms the physiologically active 1,25-dihydroxyvitamin D, also known as calcitriol. Everyone needs vitamin D to absorb calcium and phosphorus from their diet. These minerals are important for healthy bones. A lack of vitamin D can cause softening and weakening of bones and lead to bone deformities. In children, for example, lack of vitamin D can lead to rickets. In adults, lack of vitamin D can lead to osteomalacia, which causes bone pain and tenderness. 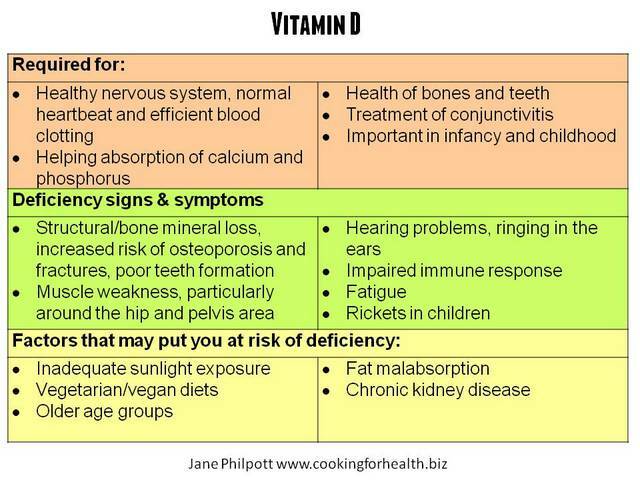 Vitamin D is important to the body in many other ways as well. Muscles need it to move, for example; nerves need it to carry messages between the brain and every body part; and the immune system needs vitamin D to fight off invading bacteria and viruses. Together with calcium, vitamin D also helps protect older adults from osteoporosis. Vitamin D is found in cells throughout the body. There are two sources of vitamin D - exposure of the skin to sunlight and food. Many factors affect UV radiation exposure and the limited research to date on the amount of sun exposure needed to maintain adequate vitamin D levels makes it difficult to provide general guidelines. Short daily periods of sun exposure without sunscreen during the summer months (April to October in the Northern Hemisphere) are enough for most people to make enough vitamin D. Evidence suggests that the most effective time of day for vitamin D production is between 11am and 3pm. The longer you stay in the sun, especially for prolonged periods without sun protection, the greater the risk of skin cancer. So remember to cover up or protect your skin before the amount of time it takes you to start to turn red or burn later on. 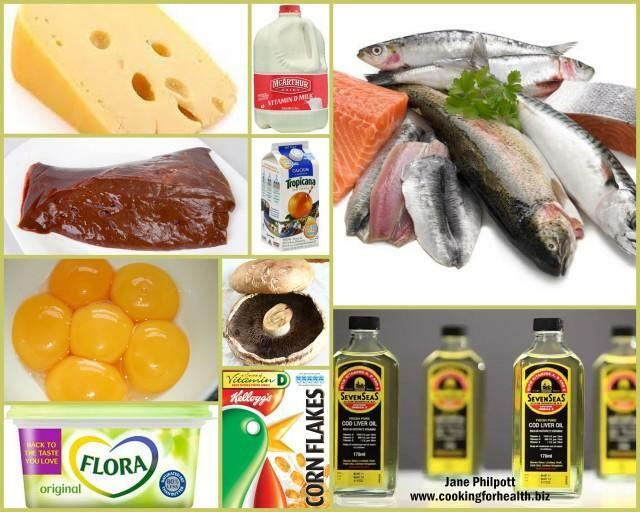 There are only a few dietary sources of vitamin D, such as oily fish, eggs, and fortified foods including margarine (which is required by law in the UK to contain vitamin D), some yogurts, breakfast cereals, some brands of orange juice and soy beverages. You have to check the food labels. 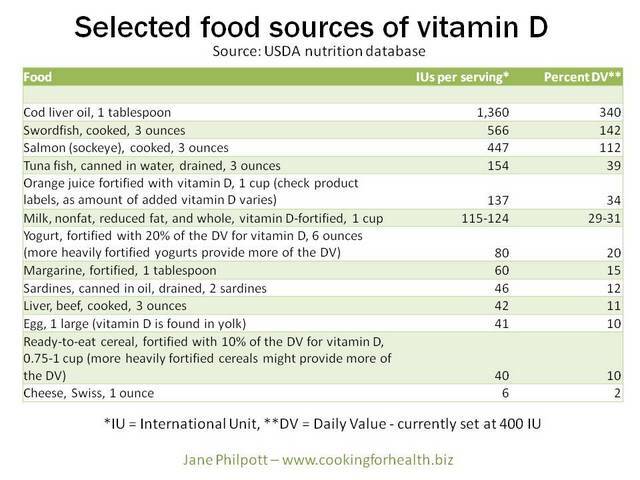 There are only trace amounts of vitamin D in milk and in the UK milk is not fortified with vitamin D.
Almost all of the US milk supply is fortified with 400 IU of vitamin D per quart. But foods made from milk, like cheese and ice cream, are usually not fortified. Beef liver, Swiss cheese, and egg yolks provide small amounts. 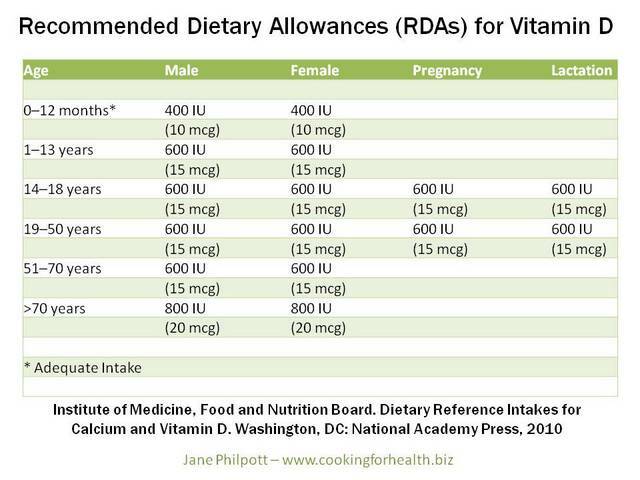 In the UK, there is currently no dietary reference value (DRV) for vitamin D for those aged four to sixty-five years. This is because, until now, there has been a belief that exposure of the skin to UVB-rays contained in sunlight is sufficient for optimum vitamin D production. This belief was not based on solid scientific evidence. 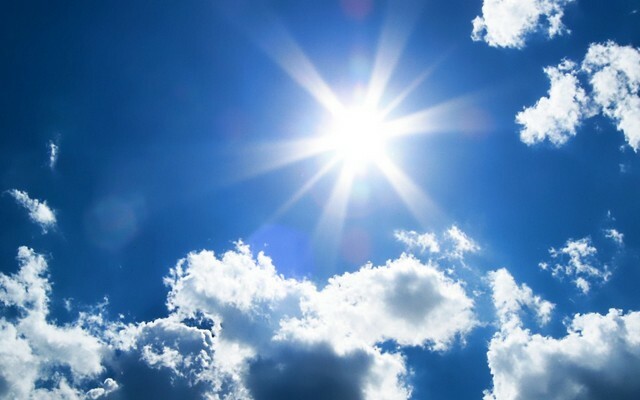 The Vitamin D Working Group of the UK Scientific Advisory Committee on Nutrition is in the process of reviewing data and commissioning further research on the effects of vitamin D on the human body. Because vitamin D can come from sun, food, and supplements, the best measure of one's vitamin D status is blood levels of a form known as 25-hydroxyvitamin D. Levels are described in either nanomoles per litre (nmol/L) or nanograms per millilitre (ng/mL), where 1 nmol/L = 0.4 ng/mL. It is important that pregnant and breastfeeding women take a vitamin D supplement to make sure their own needs for vitamin D are met, and so that their baby is born with enough stores of vitamin D for the first few months of its life. Signs of vitamin D toxicity include nausea, vomiting, poor appetite, constipation, weakness, and weight loss. And by raising blood levels of calcium, too much vitamin D can cause confusion, disorientation, and problems with heart rhythm. Excess vitamin D can also damage the kidneys. The safe upper limit for vitamin D is 1,000 to 1,500 IU/day for infants, 2,500 to 3,000 IU/day for children 1-8 years, and 4,000 IU/day for children 9 years and older, adults, and pregnant and lactating teens and women. Vitamin D toxicity almost always occurs from overuse of supplements. Excessive sun exposure doesn't cause vitamin D poisoning because the body limits the amount of this vitamin it produces, but always remember to cover up or protect your skin before the time it takes you to start turning red. People who take supplements are advised not to take more than 25 micrograms of vitamin D a day. The amount of vitamin D contained in supplements is sometimes expressed in International Units (IU), where 40 IU equals one microgram of vitamin D.